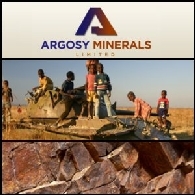 Argosy Minerals Limited (ASX:AGY) (OTCMKTS:ARYMF) is an Australian company with interests in the Rincon, Mina Teresa and Pocitos Lithium Projects in Argentina, the Wee MacGregor Copper-Gold-Cobalt Project in Queensland, and the Erongo Graphite Project in Namibia. The Company is focused on its flagship Rincon Lithium Project in Argentina - potentially a game-changing proposition given its location within the world renowned "Lithium Triangle" - host to the world's largest lithium resources, and its fast-track development strategy toward production of LCE product. Argosy is committed to building a sustainable lithium production Company, highly leveraged to the forecast growth in the lithium-ion battery sector.